When CPS Energy approached Doyle Jennings of Oak Hills Church three years ago about participating in the utility’s Demand Response program, he thought it was possible that the church’s largest building would be able to shed 100kw of power when demand on the grid was highest. “Turns out, we were able to save 300kw,” said Jennings, the church’s plant engineer. Last summer, they saved more than 500kw. The changes Jennings made were relatively minor — he turned off certain fans and bumped the temperature up a couple degrees on those afternoons when CPS Energy called for a reduction. The changes cost him nothing. At first, church staff was skeptical. They worried about the impact on congregants — would they be uncomfortable? Then staff saw its first annual refund check. “They realized it was pretty good income for the church,” said Jennings, who estimated the refund to be about $30,000 for each of the last two years. Jennings also learned how to tweak his system so it wouldn’t impact those using the building. That’s been key to convincing local business, industry and building managers to sign up for CPS Energy’s Demand Response program, says Rick Luna, CPS Energy’s manager of demand management and analysis. “We show businesses ways to reduce demand that won’t hurt the business, or their customers,” he said. Demand response, or asking certain customers to voluntarily reduce consumption at critical times in exchange for a utility bill credit or rebate, is becoming an important component of electrical grid management, especially as Texas faces ever-hotter summers and a shrinking cushion of excess power. In general, CPS Energy has plenty of capacity — that is, enough power plants to meet the community’s demand for electricity. But on the very hottest days, demand can peak to levels that require firing up expensive gas “peaker” plants. Paying certain businesses to cut back for a few critical hours several times a summer costs far less than firing up peaker plants, says Luna. Demand response is part of CPS Energy’s larger strategy for reducing demand by 771 MW to avoid building another power plant — because the cheapest power by far is the power that isn’t used. The program began in 2009 and now includes dozens of large and mid-sized companies, including hotels, government buildings, medical facilities, public agencies, churches and office buildings. Sally Flanagan, senior property manager with Endura Advisory Group, says she’s “extremely pleased” with the rebates she’s earned for making two simple changes to the SWBC Tower building – running fans at half speed and turning off all but emergency lighting in the parking garage. The changes didn’t cost her a dime, and they didn’t impact tenants, she says. “We’ve gotten no more ‘hot calls’ than usual” in the three years they’ve been participating, Flanagan said. Not all of Flanagan’s buildings have achieved such positive results; she’s hoping additional changes will increase success at the San Pedro Plaza building this summer. Some buildings and businesses are more suited to the program than others, said Luna. The threshold for participation is a 50kw reduction. Once a business has indicated interest, he said, a demand response curtailment audit is done to determine if that savings can be met. Bexar County recently received a rebate check for $23,000, said Division Chief Jose Torralva, for reducing power at the Paul Elizondo Tower, the Vista Verde building, the jail and its annex and the juvenile detention center on 17 afternoons last summer. “It’s just good for the community,” said Torralva. The success of CPS Energy’s demand response program was highlighted recently by the federal government, which has its own demand response goals. CEO Doyle Beneby was invited to take part in a discussion this week, hosted by the White House Council on Environmental Quality which brought together leaders from government, the private sector, non-profits and academia that looked at current best practices for reducing peak demand and identified new ways to do so. Not only do customers save money, Beneby told the panel, but demand response also reduces stress on the utility’s assets, saving on capital costs over time. The Electric Reliability Council of Texas, or ERCOT, which operates the state’s electrical grid, also uses demand response, although in a slightly different form. Doing so has increased grid reliability, says Paul Wattles, a senior analyst with ERCOT. “It’s been a very effective tool,” said Wattles. CPS Energy and other power entities are now working with ERCOT to expand the grid’s ability to use peak demand reduction from an aggregation of customers, much as CPS Energy already does. Meanwhile, CPS Energy continue to seek new businesses locally to enroll in the program. Those already enrolled, once they get a better understanding of how to save energy and money, tend to seek out additional savings. The county’s Torralva said this summer it would incorporate energy saving measures even in buildings that aren’t part of the program, because they’re proven to save money without impacting comfort. Jennings, of Oak Hills Church recently upgraded the lighting in the dozens of required EXIT signs on the church campus as part of a larger lighting retrofit. By replacing two 7-watt incandescent bulbs with one half-watt LED in about 60 signs, which by law must remain illuminated 24/7, Jennings calculated the church would save more than $13,000 over 20 years. 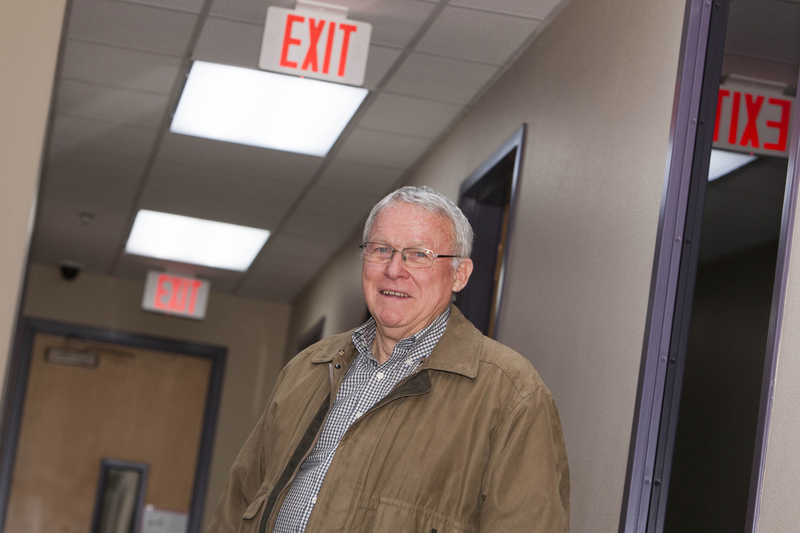 Oak Hills Church plant engineer Doyle Jennings calculated a $13,000 savings over 20 years just replacing incandescent bulbs with LEDs in the church EXIT signs. The Oak Hills Church story is a heart warming story of how $ can be saved through energy conservation. Also, some of the $ appears to be due to rebates or credits for reduced usage during peak demand periods. It does sound like most of the savings are coming as a result of an interest in conservation and, therefore, the article seems a better sell for conservation rather than for demand response per se. In any case, a $30k/yr savings is a nice payout for Mr. Jennings’ efforts.